Navy isn't only for boys! 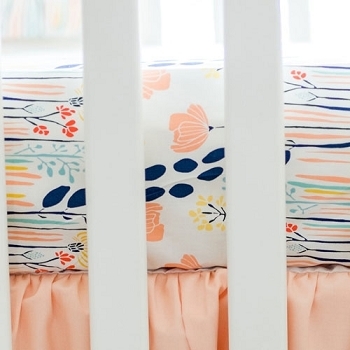 This floral navy and peach crib bedding collection is one of our best sellers for girls! 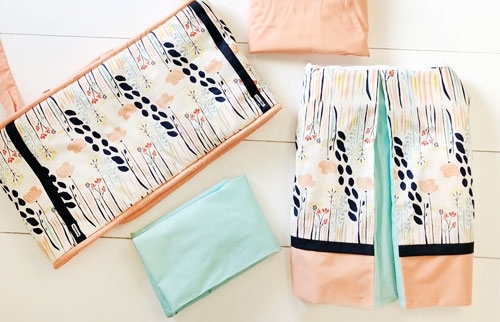 This collection features a modern floral print in navy, peach, aqua and a hint of yellow. 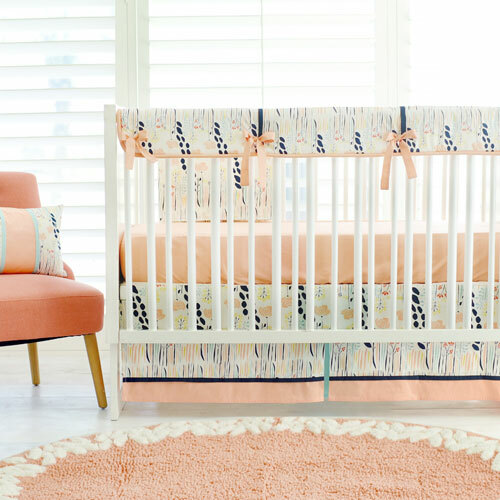 If you are looking for peach crib bedding that is different and unique, this might be the perfect bedding for your baby girl's nursery! 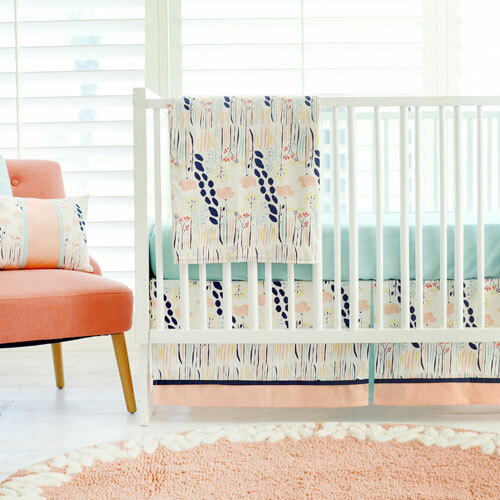 Our Summer Grove Crib Collection features a tailored crib skirt and a choice of two different cotton crib sheets. 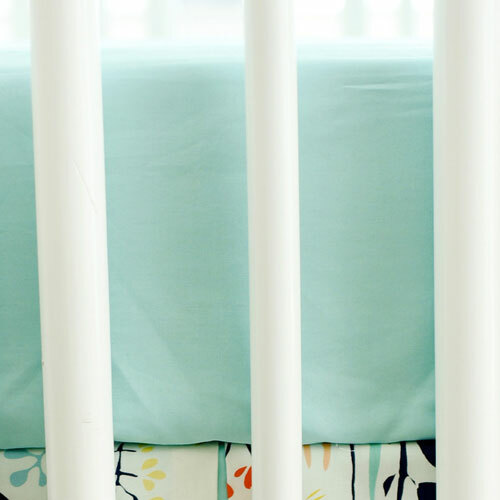 Choose from solid peach or solid aqua crib sheets for your crib bedding. 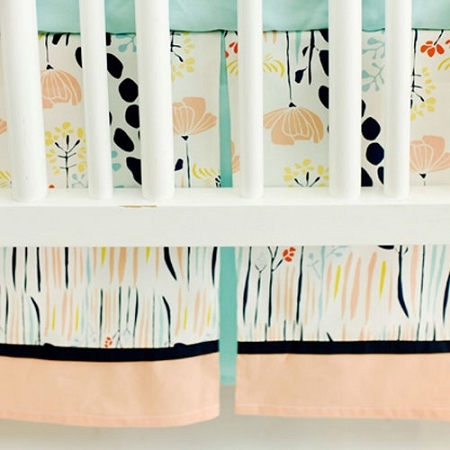 Pleated tailored crib skirt is accented with fabric bands. 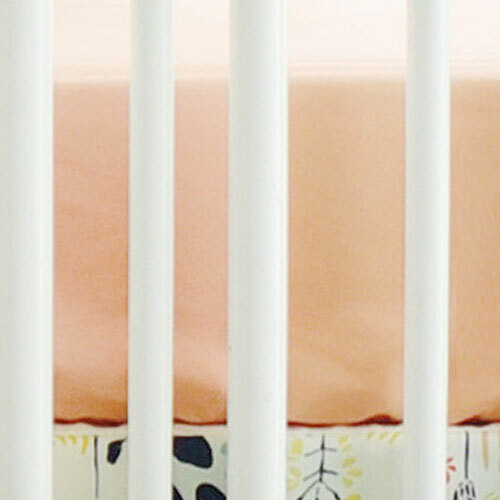 Our Crib Rail Covers are a great option for bumperless designed peach baby bedding, and will keep your baby from chewing on the crib. 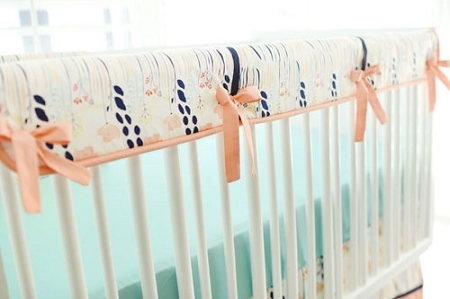 • Floral Crib Rail Cover Dimensions: 51” long by 11” deep. • Pleated Crib Skirt drop length is 17". 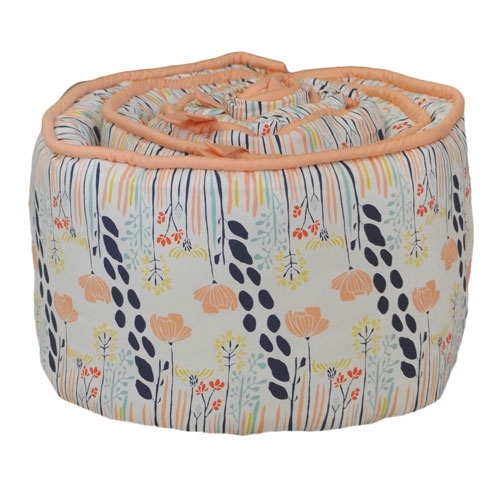 • Floral Crib Blanket is 36" by 36" is backed with soft flannel fabric. 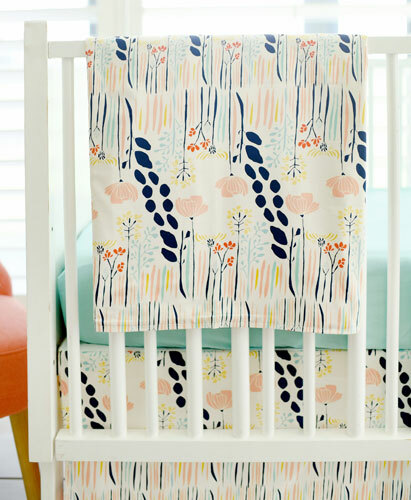 See this crib bedding on our Blog: A Summer Grove Coral and Navy Nursery. 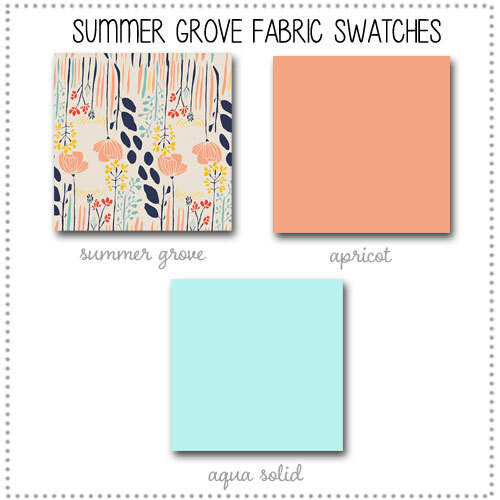 If you would prefer a crib bumper for this set, our see our Summer Grove Crib Bumper. 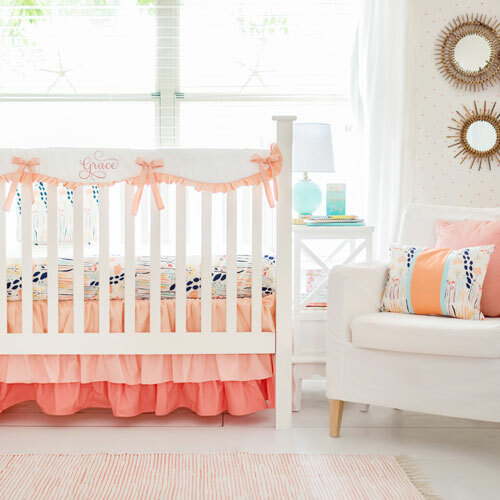 Coordinate your peach crib bedding with crib separates accessories shown below. Want to make a change to this set? Choose a different fabric, skirt style & more? Call 1-888-326-9065 or email for customization options! Such a beautiful addition to our daughters nursery! It's so unique and modern, love it! 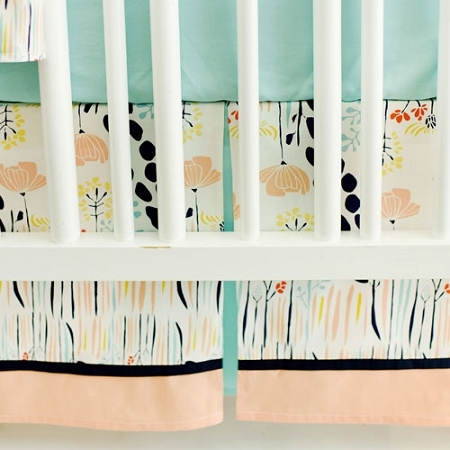 I ordered both the crib skirt and a peach crib sheet from this set. I absolutely love it! The quality is amazing and the colors are beautiful and were just what I was looking for. It was helpful the company was willing to send out swatch samples so that I could get a better idea of color. Unfortunately peach isn't just peach. I will be order the the changing cover pad to complement the crib skirt!